The notes are written on the staff and their position on the lines or in the spaces will show how high or low they are. This is called the pitch of a note. Each note pitch is given a letter as its name. The letters used for notes in music are A, B, C, D, E, F and G.
Now, there are way more notes than seven so once “G” is reached we go back to “A, B, C” and so on. An interval is the distance in pitch between two musical notes. The smallest interval is called a half-step (or semitone) and it’s easy on the guitar – it’s just one fret. So moving up or down one fret will give you two notes with an interval of one half-step. A whole step (or whole tone) is an interval of two half steps or two frets on the guitar. The technical definition of an octave is the interval between one musical pitch and another with double or half its frequency. Ouch – that’s physics! What does it really mean? Well if you play the open 5th or low A string and then play a note at the twelfth fret on the same string you will get another A note which sounds harmonically similar only higher – it shares the same tonal qualities and is said to be an octave above the low A you played first. That means there are actually twelve frets or half-steps between the low and high notes of the octave. An octave is simply an interval of twelve half-steps. Now you’ll recall that there are seven letters used to name the notes – A, B, C, D, E, F and G, and then we return to A to make an octave, – there appears to be some notes missing. That’s because the intervals between most of the natural notes are whole steps, i.e. two frets apart – but there are two exceptions. There’s only a half-step between B and C, and E and F – all the other intervals are whole steps. If you’re familiar with a piano keyboard then you’ll see all the white keys are labelled with one of the letters from A to G. And the black keys? – that’s where sharps and flats come in. A note raised by a half-step it is called a sharp and the symbol is like the hash key sign #. A note lowered by a half-step it is called a flat and the symbol is ♭ which is similar to a lowercase b. On our keyboard above there is a whole step between C and D. The intermediate note is a C note raised a half-step and is called C sharp or C#. The intermediate note could also be considered to be a D that has been lowered a half step and called D flat or D♭. The note therefore has two possible names, which can be confusing, but it should make more sense in the lesson about key signatures and is nothing to worry about now. Guitarists use keys with sharps more than those with flats so for the time being we’ll call the intermediate note C#. Looking at the black keys on the piano there are five sharp notes – A#, C#, D#, F# and G#. 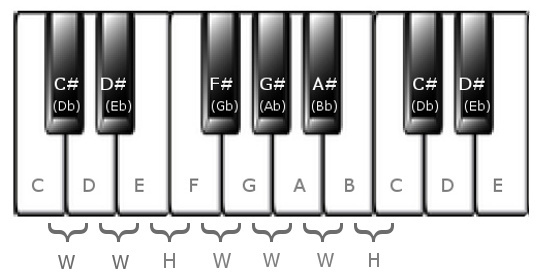 These five sharp notes and the seven natural notes A, B, C, D, E, F and G make up the twelve notes in the octave. There weren’t many guitars around when music notation was first developed so it’s not geared up for the guitarist! The position of the note on the staff determines the pitch so we need to know where each note is placed. The notes that appear in the spaces between lines are F, A, C and E, which is easy to remember as it spells FACE. The ones on lines are harder to remember E-G-B-D-F so many music teachers make up a phrase that easily springs to mind. The one I learnt as a child was “Every Good Boy Deserves Fudge” but you may think of something else like “Even Giraffes Buy Dog Food” or “Every Girl Buys Designer Flipflops”. Whatever sticks in the mind for you is good – even if it’s rude! The second C note in bar one has a sharp sign (#) placed immediately to its left which raises it by a half tone. The C note in bar two doesn’t have a sharp sign (#) and reverts back to the natural C. Listen to it here. Although you can tune the strings of a guitar to any note, the vast majority of music is written for guitars that are tuned in standard tuning. That is to say E-A-D-G-B-E. So the lowest string, or the 6th string, (the thickest string) is tuned to a low E. The fifth string is tuned to A, the fourth string is tuned to D, the third string is tuned to a G, the second string is tuned to a B and the 1st string (or top string which is the thinnest) is tuned to a high E.
Here are the notes of the open strings on a staff. You can use this to tune your guitar or, even better, use the Tuner which can be found in the Resources Menu. There’s only one place you can play a low E on the guitar and that is on the unfretted open 6th string. But, unlike a piano or keyboards, most other notes can be played in several positions. Let’s look at the note often called middle C. This is how it looks on the staff. But the same note with the same pitch can also be played in several positions on the fretboard. However, it will only ever have one position on the staff. Try experimenting on your guitar by finding notes of the same pitch at different positions on the fretboard. But that gives us a problem – how do we know which position to play a note if it only has one position on the musical staff but can be played at several places on the guitar? Well, don’t worry about that yet – we’ll only be using the notes played on the first few frets in the early beginner lessons and, rest assured, there are ways that music notation can help us with the other positions which we’ll cover later on. Each note has its own specific place on the staff, either on a line or in a space between the lines. A note pitch refers to how high or low it sounds. A guitar is usually tuned E-A-D-G-B-E (going from the low E to the high E.